Where Was Plant Grafting Invented? Graft fruit trees in the spring when buds appear, but before blooming, for best results. 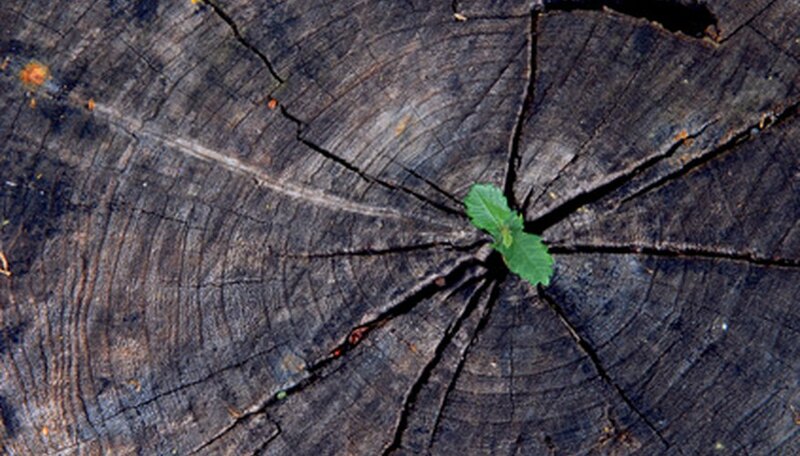 The bark of the wood must slip easily from the root stock to promote grafting. Graft citrus frees in either fall or spring. Whip grafting is used for small trees and bark grafting for large trees. As the UC Extension notes, trees grafted in the fall should be given protection from freezing weather. Obtain scion wood from the desired oak trees. Scion wood are the young branches on trees, roughly 1/4 inch in diameter and 8 to 12 inches in length. Place the wood in a refrigerator for storage if it will not be used immediately. Find a viable stump and saw at least 3 inches off of the top to provide a fresh grafting location. A viable stump will be free of diseases and boring insects. Use a grafting knife to cut an upside down "T" in the bark of the stump, just below the stump's top. The T should be roughly 2 inches long and 1 inch wide at the bottom. Do not cut too deeply, just through the hard, outer layer of the bark. This will provide the budstick with the correct placement next to the nutrient-providing portion of the tree. Trim the scion wood so that the tip forms a diagonal. Push the diagonal end into the "T" cut in the stump's bark until it remains firmly in place. Paint the entire grafting area and the top of the stump with asphalt sealant to prevent moisture loss and disease as the plant's graft heals. New growth will appear within 6 weeks of grafting if the graft was successful. Cleft grafting is a method of changing the top growth of a plant by collecting small scion wood, 3/8- to 5/8-inch diameter and attaching it to to top of a plant through a vertical incision. The bottom of the scion wood is cut into a wedge shape, while propagating area is cut vertically. The two pieces are then placed together like a puzzle. 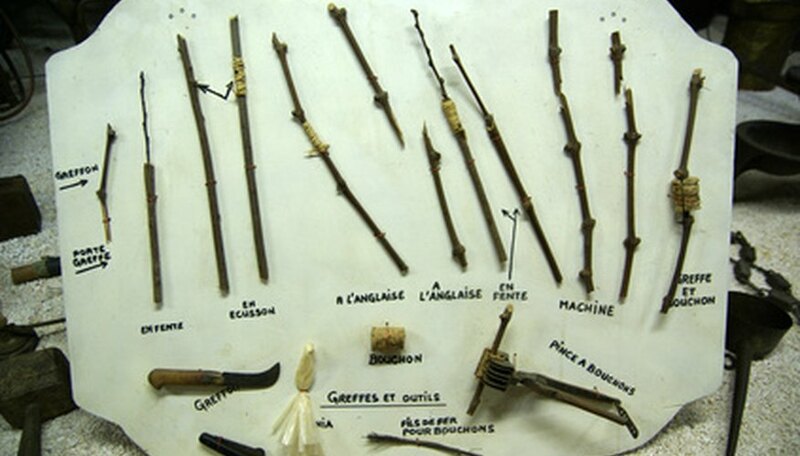 Whip grafting is the simplest method and recommended for grafting beginners. This graft is done in the early spring before a tree or plant begins to bud. A scion is prepared from a donor plant, which is attached to a piece of rootstock. The scion and the rootstock are generally the same diameter, but the scion can be slightly smaller than the rootstock, but not vice versus. A 1/2 inch sloping cut is made into the rootstock, with an identical cut made into the root stock. The pieces are fitted together and attached with wax or grafting tape. Budding is the process of uniting one bud of a tree, with a small piece of bark attached from a scion to a rootstock piece. Budding is faster than other grafting methods and makes a stronger bond once it heals onto the new plant. Budding is usually attached to a wound on a rootstock, where bark has been cut away. Make a long, sloping cut from one side of the main root stock trunk to the other. Make this cut between 1 and 2 inches long. Make a downward cut from the center of the initial cut to the point in the root stock where you began the initial cut. Be sure to cut, not split, the wood. This tongue will need to match to a similar tongue on your scion. Make a similar series of cuts on the scion. The wood and cambium, or growth area between the bark and woody parts of the tree, will need to come into contact when the two pieces are slipped together. Slip the scion into the root stock, and wrap the joint securely with masking tape to ensure good contact between the two pieces. Seal the tape and graft with grafting compound. Remove the tape and grafting compound when the scion begins to grow. Propagating refers to taking part of a parent plant to create a new plant. Several forms of propagating include planting seeds, grafting and budding. The newly formed plant is identical genetically to the parent plant. Cut healthy budding branches from the plant with a sharp grafting knife. The branches should be roughly a quarter inch in diameter, 2 inches in length and should not be too woody. Cut a diagonal incision into the rootstock so that all the layers of the stalk are showing. Cut a diagonal incision into the budstick and immediately pair it with the incision on the rootstalk so that the diagonal match up, making a straight branch. Wrap a rubber band tightly around the new branch to firmly hold the two pieces together. Brush the grafted area with grafting wax to completely seal off the graft. This prevents moisture loss and protects the tree from diseases. If the graft was successful, then new growth will begin to appear in about eight weeks. Once new growth appears, the rubber band can be removed. The first known use of plant grafting was by the Chinese in 1560 B.C., according to Union County College. Plant grafting is the process where a piece of one plant is placed into a cut made in another plant. The wound will heal and the grafted piece will retain its characteristics. One example is when several types of fruit plants are grafted onto one tree. Cut a 5-inch branch of new growth off of the donor adenium plant and wrap the scion in a wet paper towel to keep it fresh. Trim a 3/4-inch section from the scion to form a wedge using a sharp knife. Do not touch the exposed area to prevent oils from the hand from ruining the connection point. Remove 3 inches from the stem of the adenium rootstock, then make a 3/4-inch cut vertically across the cut surface to make a connection point. Keep the cut open with the edge of a screwdriver cleansed with rubbing alcohol, says the University of Missouri Extension. Insert the wedge of the scion into the rootstock cut so that the exposed area is completely covered in exposed flesh. Wrap the scion with grafting tape. Check on the graft in two weeks to see if the scion is actively growing and looks fresh. If the scion looks dead, the graft did not take.